When Napoleon and his Grand Army reached Moscow, on the 14th of September, 1812, nearly the whole city had been abandoned. Later that evening, the first fires appeared in Moscow. Did French troops set the fires? Did Russian partisans set those fires? History does not clearly answer those questions. In War and Peace—which the BBC brought to film in a stunning 1972 production starring Anthony Hopkins as Pierre Bezukhov and the Metropolian Opera succinctly summarizes at its website—Leo Tolstoy seems to suggest that the fires were not set deliberately. Foreign troops, in Moscow, may not have realized how many of the city's structures were made of wood. Building fires to stay warm or cook food, French troops may have lost control of small fires which grew into a massive conflagration without the help of operating fire departments. Although we may never know how the fires began, we know their result. Moscow, and its many wooden buildings, endured a massive disaster. 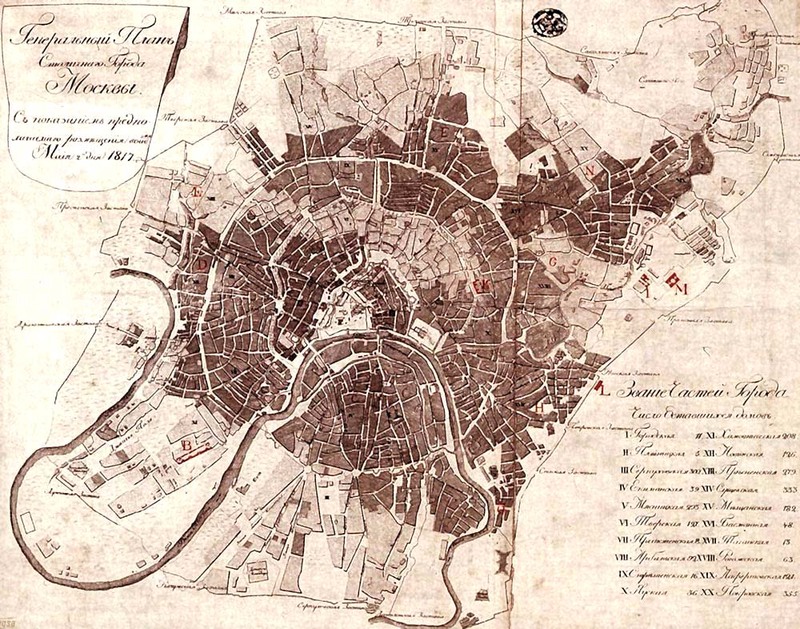 Shaded areas, in the map below (which was prepared by Russian topographers in 1817), depict parts of the city which burned during Napoleon’s attempt to capture the Russian capital. The map was later published in an 1831 work entitled (in English translation) Moscow or Historical Guide to the Famous Capital of the Russian State. We also know this ... when Napoleon arrived at the city, he had so-longed to conquer, it was largely empty of people. 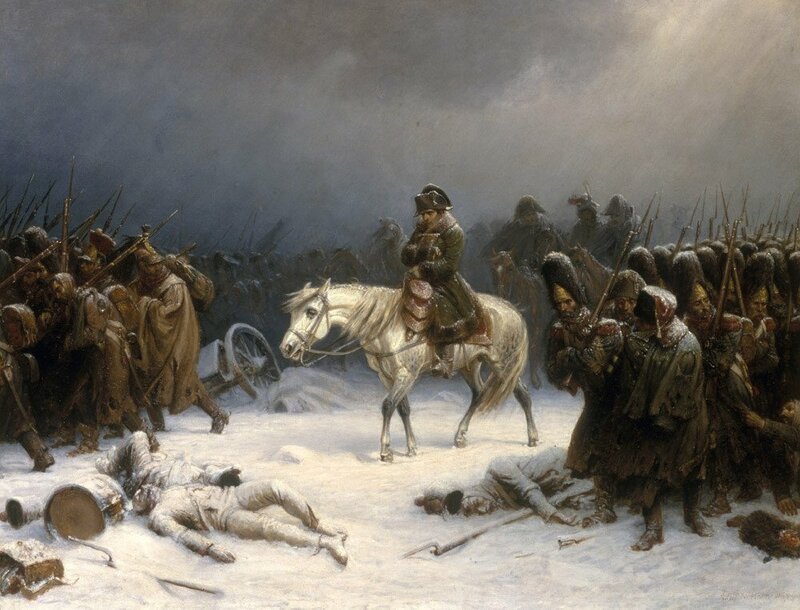 After so much effort, and so many lost lives, Napoleon did not experience a grand "surrender" of the Russian people. Soon after Moscow burned, Napoleon and his advisors decided it was time to retreat. They began their withdrawal around the middle of October, in 1812. Even more men died during their wintery journey back to France. The painting's title references the Zamoskvorechye District in the center of Moscow. Image at the top of the page, described above, online courtesy Wikimedia Commons. In-text image from Москва или исторический путеводитель по знаменитой столице государства Российского (Moscow or Historical Guide to the Famous Capital of the Russian State). Bos, Carole "Firestorm in Moscow: September 14, 1812" AwesomeStories.com. May 24, 2013. Apr 19, 2019.